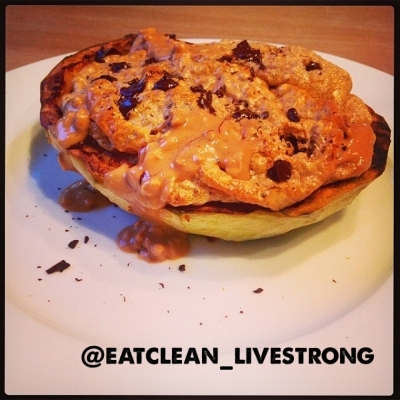 moist and fluffy protein cake in a squash! NOTE: the protein powder I used was ABOUT TIME PEANUT BUTTER WHEY not what is listed hereâ€¦ the database just didnt have it! 1. Core about 200 g of Kabocha Squash and cook face down on a pan with a little cinnamon for about 35 minutes at 400 degrees. 2. While it's baking, combine all cake ingredients in a bowl, ADD 1/2 tsp butter extract as well. 3. Once the squash feels cooked through, pull it out and core about 1/4 cup of cooked kabocha and add it to the batter. 4. Pour in cake mixture and place back in the oven until a toothpick comes out clean in the center. I don't remember the exact time, IM SORRY!! but it was around 20-25 minutes.